Sweet pineapple and savory ham glazed with a light balsamic and brown sugar sauce, this turned out so much more delicious than I even hoped. I tasted it when it was still way too hot right of the oven and it was perfect. I quickly snapped a few pictures, despite the fact that I truly did not have enough light. I wanted to be sure to save the recipe to make again soon. I think this will be excellent on the grill as well; so I’ll be doing that next time! Move the top oven rack to within 6 inches of the broiler and then preheat the oven to broil. (This would also be excellent on the grill.) 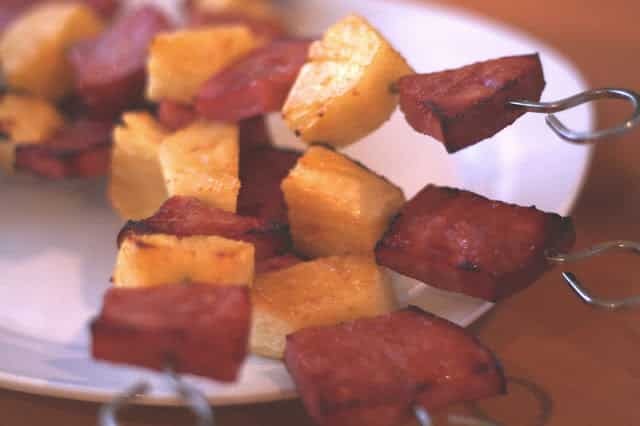 Slide the ham and pineapple onto skewers and set aside. Layer a large baking sheet with foil and place a wire rack over it. 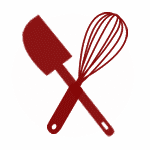 In a small bowl, whisk together the sugar, oil, vinegar and mustard. Place the skewers on top of the wire rack and brush them with the glaze. Place in the oven and broil for 5 minutes. Remove from the oven, carefully turn the skewers over and brush with the glaze again. Place back in the oven and broil 5 more minutes. Liberally baste the skewers with the rest of the glaze and broil an additional 3 minutes or so, until they begin to caramelize and become lightly browned. Remove from the oven and let cool a few minutes before eating. Enjoy! This looks great! I would definitely cook mine on the grill and buy the pre-cut pineapple in the produce section to save some time! I used to love Hawaiian pizzas when I still ate meat...I'm sure I would have loved these kebabs also! I LOVE ham! Esp. smoked ham. Skewers! Pineappple and Ham are the Best together. gosh, this does sound especially good! a tasty holiday appetizer. it is difficult, these wintry days, to have enough natural light for our food photos--like you, I just snap the best I can. 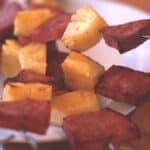 I love the ham and pineapple combination, sound like a winner to me. You really have me hooked on pineapple! My kids love it too and I actually bought two when I was at Trader Joe's on Sunday. This sounds so good and the glaze sounds wonderful. I agree - bet it would taste awesome on the grill! Did you burn your tongue?? You are making me wish that I had some leftover ham!